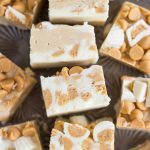 Tiger butter – a super easy candy made of melted white chocolate, mixed with creamy peanut butter, and swirled with milk chocolate! This special version also features chopped mini REESE’S cups on top! Peanut butter and milk chocolate, a classic duo. A favorite combo of mine, to be sure. Of course, you could combine a great many things with peanut butter and I’d be pleased as punch. Better still than the traditional PB and milk chocolate pairing is PB plus milk chocolate PLUS white chocolate. Now we’re *really* cookin’. The only way this could possibly get any better is if we also add dark chocolate. I know, that would be madness. Which is why we must do it. I have a large party-size bag of mini REESE’S cups burning a hole in my pantry. It’s a bag of assorted cups, so it contains milk chocolate, white chocolate, and dark chocolate REESE’S. #heavendoesexist. I spotted it at the grocery store over the weekend and I stopped in my tracks. I could not leave without it. I LOVE tiger butter candy and thought it would be delicious and marvelous to chop up the assorted cups and sprinkle them on top of traditional tiger butter. 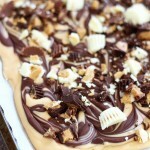 Tiger butter is a layer of melted white chocolate mixed with creamy peanut butter, and then swirled with milk chocolate. It’s fantastic on its own, but it’s phenomenal with a sprinkling of chopped REESE’S. The result looks soooo pretty and swirly, and tastes divine. It is truly the ultimate in combining chocolate and peanut butter: ALL kinds of chocolate, LOTS of peanut butter. 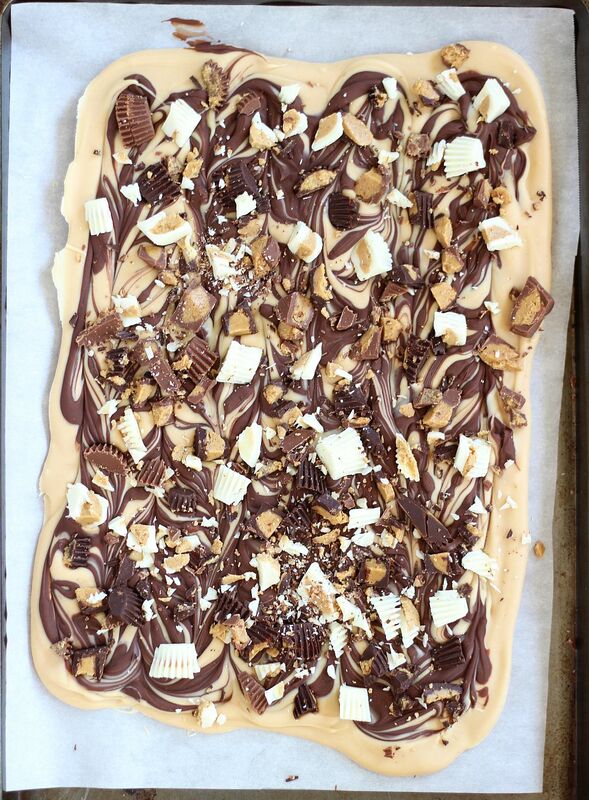 I can’t think of another way to add more chocolate or peanut butter to this candy or you know I would. Therefore, it is perfect and complete. Best of all, you can have this made and ready-to-demolish in about 15 minutes. Okay, that is not even close to being the ‘best of all’ to this recipe, but quick preparation is always a bonus. Also, you don’t need an oven or stove top. Your microwave will get the job done. You barely even need measuring cups! It really is super simple and fast to make. 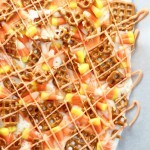 This candy is great for a party because it’s a crowd-pleaser that everyone loves, and that will also actually feed a crowd. For example, let’s say your S.O. forgets to tell you that he invited people over to watch basketball (because that’s what March is alllllll about in the sports world), this is what you make. Impromptu gatherings at the house for sporting events is a common occurrence for me. This month, it’s been all about the big basketball tournament! Thankfully, this tiger butter candy has been my ace in the hole! 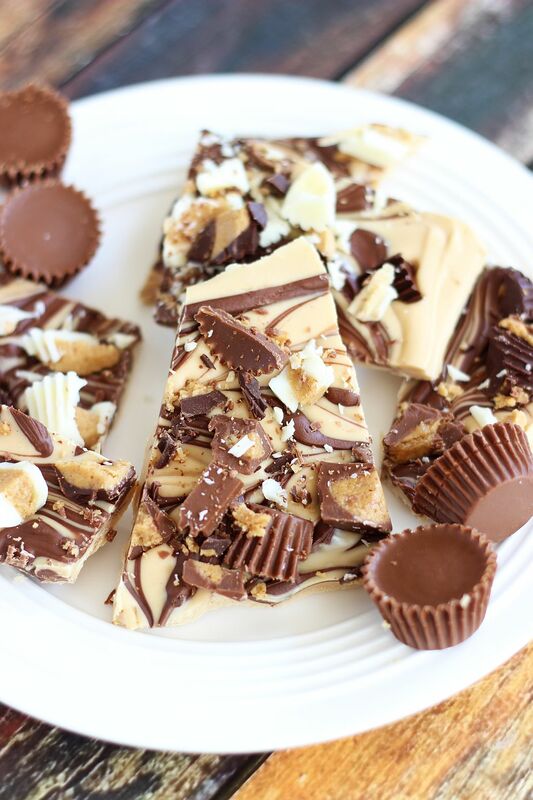 A super easy candy made with melted white chocolate, creamy peanut butter, milk chocolate, and chopped REESE'S cups! Place white chocolate in a large microwave-safe bowl. Microwave the white chocolate for 60 seconds. Stir, and continue microwaving it at 15-second intervals until it's melted and smooth. Add the peanut butter to the white chocolate, and mix until smooth. Spread this mixture onto the parchment paper in a thin layer. In a small microwave-safe bowl, microwave the milk chocolate chips for 30 seconds. Stir the chocolate, and continue microwaving at 15-second intervals until it's melted and smooth. 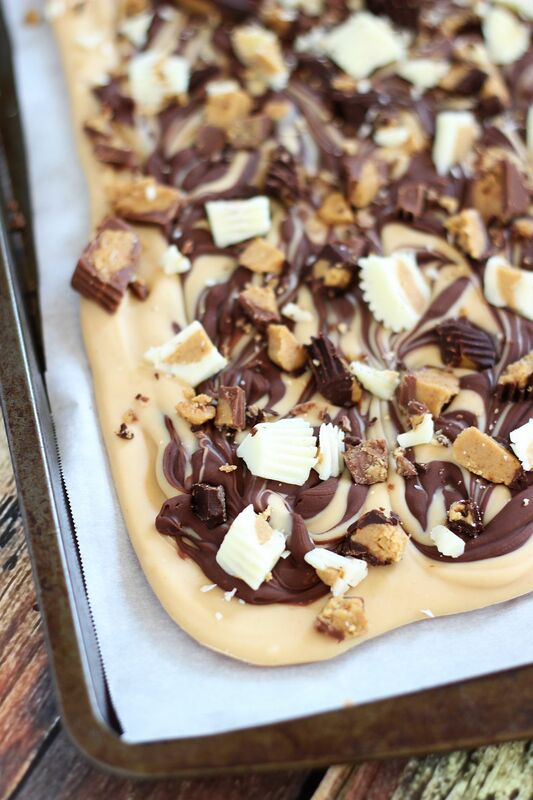 Drizzle the melted milk chocolate over the white chocolate mixture, and then use a knife to swirl them together. 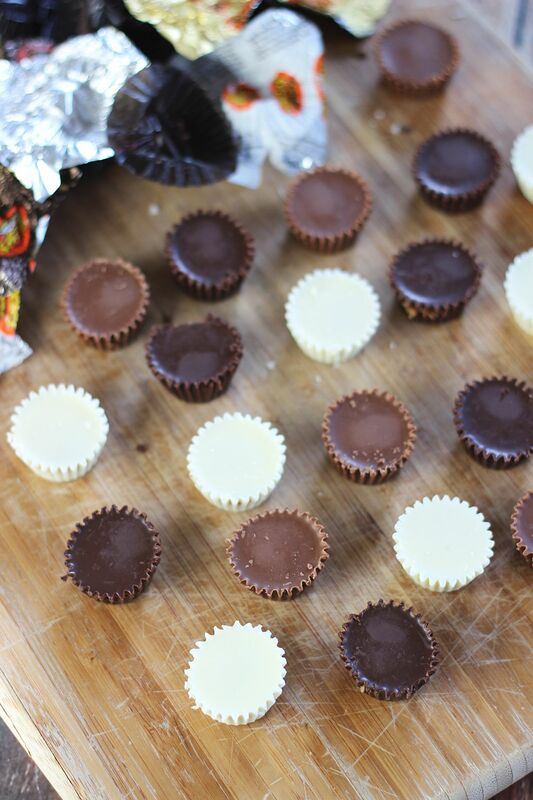 Sprinkle the chopped REESE'S cups evenly over the top. Place in the freezer for about 10 minutes, or until set. 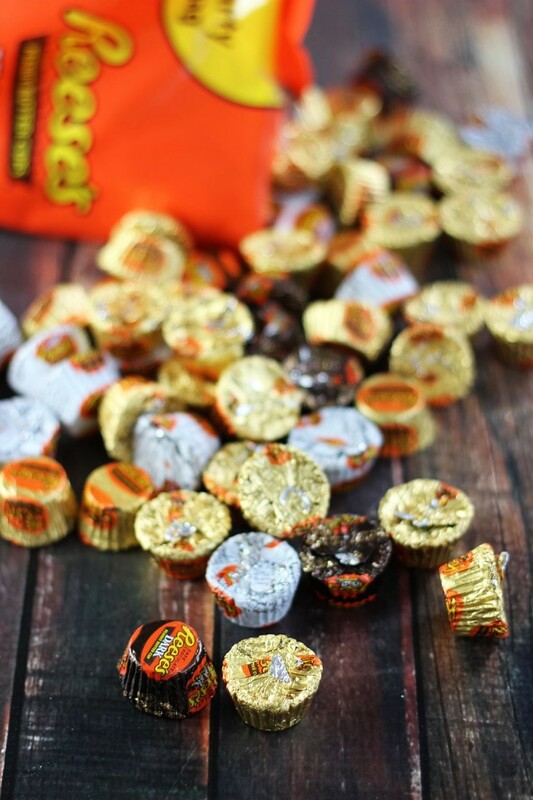 Reese’s are my all-time favorite! I love how you made tiger butter, Sarah! So creative and looks so delicious to munch on! Omg, it’s so good! And it keeps staring at me from the kitchen counter. I want to devour it all, but I’m trying to control myself. Lol! Thanks, Gayle! These look amazing!! Love love the swirl! Thanks so much! I love it when food is also pretty! The swirls looked pretty cool! I’ve never had tiger butter but this looks fantastic! This looks absolutely RIDICULOUS. Wow. 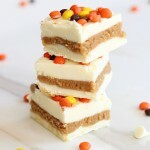 I have to make this ASAP! 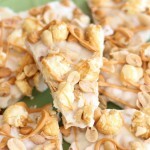 Okay, now THAT looks like a white chocolate recipe that I could get behind! Add peanut butter and regular chocolate and I’m happy! I’ve never heard of tiger candy but wow, I want some! 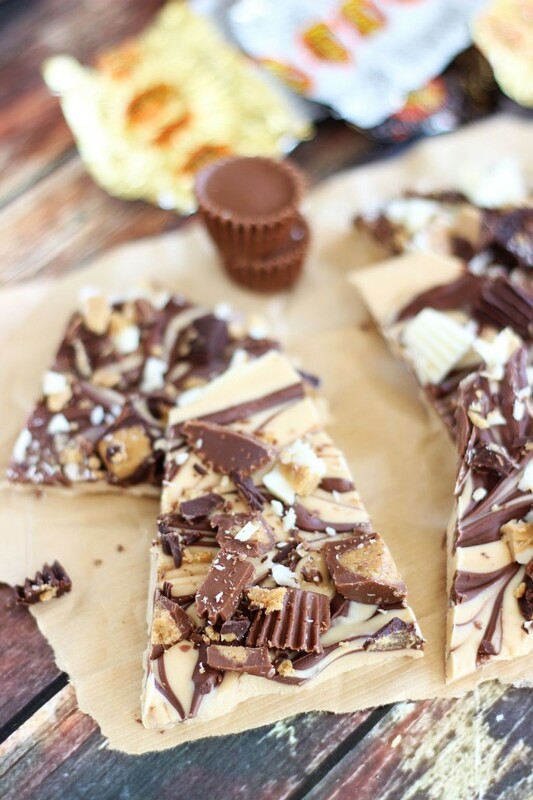 Love Reese’s PB cups and this looks fantastic! Pinned and shared! Oh, wow. I’ve never heard of Tiger Candy, but now I must have it. That looks amazing. You guys would love it! It’s awesome! And it’s super, super, super easy! 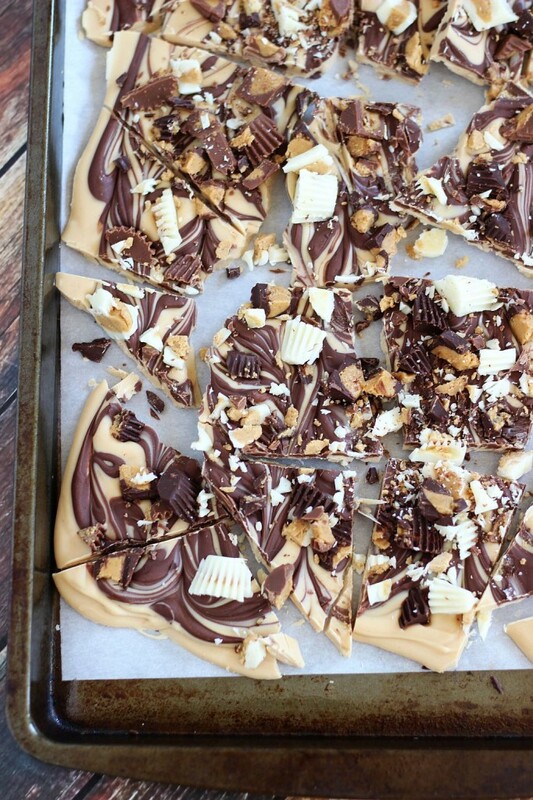 You love to make chocolate bark anyway, so you guys would have fun making this and it’s so simple. This looks absolutely amazing, Sarah! I love the pretty swirls! Reese’s are our favorite! Oh Sarah, I want some! 🙂 My favorite combo! Yummy! 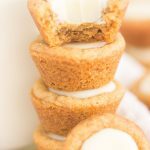 My mouth is watering 🙂 I would love for you to share this over at my new link party Making Memories Mondays going on now! Oh, cool! Congrats on the new link party! I’ll try to stop over! 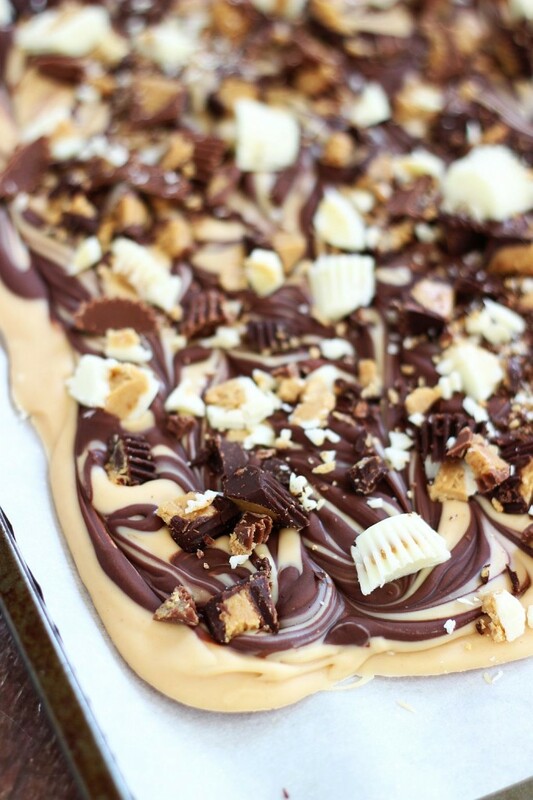 So glad you like this… cannot go wrong with PB and chocolate, right? Thanks so much, Cathy! I had never heard of tiger butter before. But the fact that there is peanut butter in it is a major score for me! 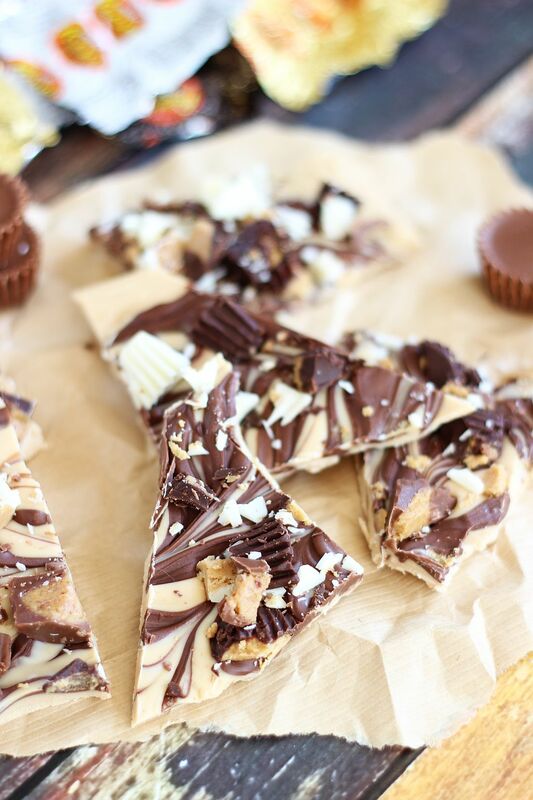 And then you added reeses peanut butter cups on top of it all? I think it makes it even more beautiful! We’d love to have you over at #FoodieFriDIY if you have the time! Tiger Butter is new to me as of the last few years too, but once I learned about it, HELLLO! I am hooked! It’s amazing! So much PB. 🙂 Thanks, Christine! This like pretty and yummy party food! Thanks for linking up at #PureBlogLove Link Party. This looks like adorable and delicious party food! This looks amazing!!! Thanks so much for taking the time to link up with us over at the #HomeMattersParty – we hope to see you again this Friday! Feel free to bring a friend! Thank you for the party, Kristen!